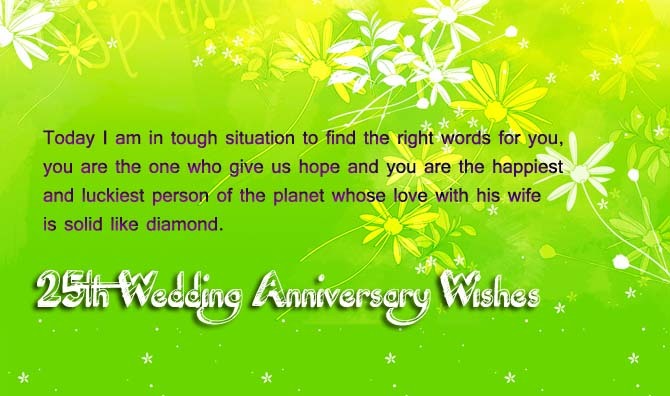 25th Wedding Anniversary Wishes for Uncle and Aunty: Wishing anniversary to your dear ones is always amazing. Your older are always an inspiration for us in every aspect of life. Wish you older in their wedding anniversary and make them feel proud they are successful in their marriage life. The marriage years are the best year in their life and here some of the exciting messages for the 25th wedding anniversary. Today I am in a tough situation to find the right words for you, you are the one who gives us hope and you are the happiest and luckiest person on the planet whose love with his wife is solid like a diamond. Happy 25th anniversary to dear uncle and aunty you are just amazing with your love and integrity. I believe your love in future also remains the same either its increases. 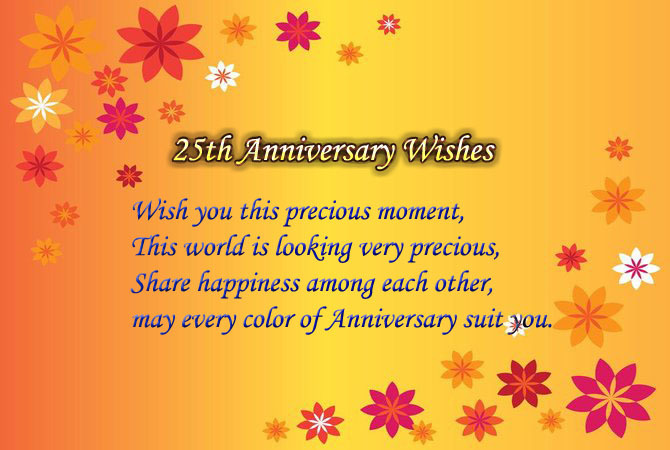 Wishes you a very Happy 25th anniversary on this beautiful day. God will continue his showers of blessings on you in the form of love and happiness. From the very first anniversary to this anniversary, I remembered your couple is the best, you still cheers each other and also supports when it’s needed. Happy 25th Anniversary to a lovely couple. Your heart may fill with love for each other and wish you a very Happy 25th anniversary to the wonderful couple. 25 years of life matters, but when these years are spent with someone they actually means a lot. You love someone, support her and then you don’t even count it. That’s a feeling which can’t be expressed with words. This day was a day when you got to engaged to each other. It takes a moment to commit love with someone but it takes a real time to fulfill this commitment. If I want to see the best example, it always leads me to you. As you beautifully spent these 25 years. I always remember the day you both got engaged, you were a couple always to be remembered, I pray that may every couple get the love like you. May you be with each other for the whole life, as you always did. You are the people who create an example love for others. There is a beauty in every personality of this world, but when a couple of beauties comes together, no one can imagine the beauty of such relation. I present you, all the colors of world, flowers of all color, scent of all the flowers, moments of all scent, and a pray for life full of these moments on your wedding anniversary. Gorgeous moments of gorgeous people and the lights of these gorgeous moments may always keep waiting for you. The moment of your anniversary has arrived, be happy always because no one can imagine how beautifully you have created your beautiful world. Always keep it safe. May your couple remains happy forever. Countless love flow in your life and every day remain full of attractions and every evening spend in the presence of each other. Wish you this precious moment, this world is looking very precious, share happiness with each other, may every color of Anniversary suit you. Flowers are blooming in the way of life, a smile is flashing in your eyes and may you get happiness at every step. This is what my heart is praying again and again. I pray that you remain together for as long as there are stars in the sky, hairs on the head of Russian boy and you never have to cry. May your eyes shine like stars, may your lips always fill with smiles, and may you never face any problem in your relation. May you always make the enemies jealous. May your destination be clear always, your definition must be in a way that no relevancy must leave behind, and at last it is a pray to God that his blessings always be with you. I can see the flowers which are showering their petals on your way. I think they are welcoming you for a bright and happy future of your relationship. Your relation is like a sun which glows at its peak to assure its presence. Your love is like a moon which lights the world even in dark places. May all these things be with you forever. That’s what I really want to. Today I woke up and saw that here is a pretty feeling in the environment, there is a sweetness in the wind, there is breeze which satisfies the worried one. Of course, it’s your love which is surrounded all over the world today. This day belongs to you forever. This day will sure enlighten you again and again in life. Every morning will be a morning of new happiness and you will never face distance in life. This is a pray from the core of my heart.